Investigating single genes, their functions and roles is commonplace in today’s medical and biological research. At the School of Nursing’s Genomics Translational Research Laboratory (GTRL), that research is getting personal. Genomics, the study of the complete set of DNA in an organism, is broader than the study of single genes, which are parts of the bigger genome. The GTRL is taking that research a step further by applying rapidly emerging genomics knowledge to battle health problems. 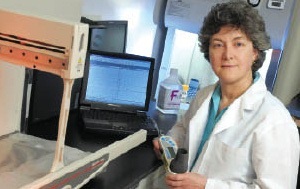 Dr. Patricia Newcomb uses the Genomics Translational Research Lab for her studies on childhood asthma. Funded by a $500,000 grant from The University of Texas System, the GTRL is a collaboration among researchers who, in addition to Dr. Newcomb, include School of Nursing faculty members Barbara Raudonis, Diane Snow, Maxine Adegbola and Patricia Kelly. Located on the first floor of Pickard Hall, the lab also partners with the Department of Biology’s genome biology group and the Department of Psychology’s health psychology program. “This partnership is based on a commitment to look for and be open to opportunities to collaborate in research and learning,” Newcomb says. For example, Newcomb is a pediatric nurse practitioner who most recently has conducted research in childhood asthma. Through the GTRL, she works with two UT Arlington biologists, Elena de la Casa-Esperón and Jeff Demuth. She also has teamed with Cook Children’s pulmonologist Maynard Dyson on a study of DNA methylation (a chemical modification of DNA) in children with asthma. They are exploring the role of methylation in regulating the expression of several asthma-susceptibility genes in children with respiratory problems. A second study examines if deletion of a gene that detoxifies pollutants causes asthmatic symptoms to worsen in children when they exercise. “If we find out it does in the clinic, then we could apply that information in the real world to anyone designing an exercise program for a child with, or even without, asthma,” Newcomb says. In a separate pilot study, Dr. Raudonis and co-investigator Jenny Ellis, an oncology nurse at Harris Methodist HEB Hospital, are exploring cytokines (regulatory proteins) and fatigue in women with breast cancer. They will measure selected cytokine levels prior to chemotherapy, during chemotherapy and two months after completion of therapy. “Our research will contribute to patient care by helping to develop better predictive models for identifying breast cancer patients who are at risk for debilitating chemotherapy-related fatigue,” Raudonis says. The GTRL plans to explore policy-oriented areas that ask: How much do research subjects understand about studies that involve genetic testing? What are the attitudes of the public/consumers regarding genetic testing? How much do health care providers know about genetic testing? When do they need more knowledge regarding genomics? The research is just getting under way. Newcomb says that once there’s enough basic research to establish a genomic influence in a patient’s symptoms, nurses can look at how to use that information to change the kind of health care individuals receive.